"Yamaha drums produce very solid tones during both live and studio sessions. You know what you’re getting when you sit before a Yamaha kit, powerful and consistent sounds that resonate throughout the venue and great looking drums"! 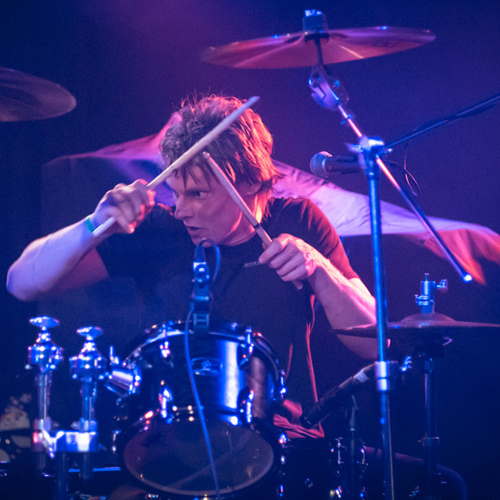 Rowan Mullett-Treloar, the man behind the kit for APES, is the consummate modern rock drummer; he hits hard, is solid in his delivery and is all about ‘the song’. A multi-talented musician who can play guitar, sing and is a songwriter in his own right, Rowan concentrates on writing and playing drums that complement the other instruments and the songs as a whole. Whether it’s in the studio or in front of a packed sweaty venue, Rowan Mullett Treloar plays with great feel and consistent delivery. Hot on the tail of their debut single ‘Seven’ (late 2012), Melbourne four-piece APES came to the attention of national youth broadcaster Triple J, and more recently some serious love from UK’s BBC Radio 1. Their second single ‘Helluva Time’ garnered ‘Record of the week’ on BBC Radio 1 thanks to Phil Taggart and Alive Levine and also received airplay from the influential DJ - Zane Lowe. Combining an ear for scrappy, rough and ready melodies with strong hooks (and those can’t forget ‘em choruses) APES stamp the sound as their own. Having played shows around the country with the likes of The Datsuns, Dune Rats, FIDLAR and Yacht Club DJs, APES high energy driven live show also landed them spots on 2013’s Big Day Out and Groovin The Moo Festivals.